Today might be the last big harvest. Leaves are dying and a frost is expected this week. I still have dozens of tomatoes and pepper on the plants and I have not decided how to deal with that. I could pick them all green and let them turn red inside over the next few weeks. I could try covering the plants with blankets and hope for the best. I have heard that pulling the plants up and then hanging them upside down can allow the tomatoes to grow a bit more and ripen better, but I don’t think that is practical. Some of the plants are about 6 feet tall and about half as wide. I can’t imagine being able to move them and hang them with out damage. The Garden is over. Sure I have several winter crops that should do fine with a light frost; carrots, cabbage, peas, lettuce and lots of herbs. But those don’t feel quite the same. 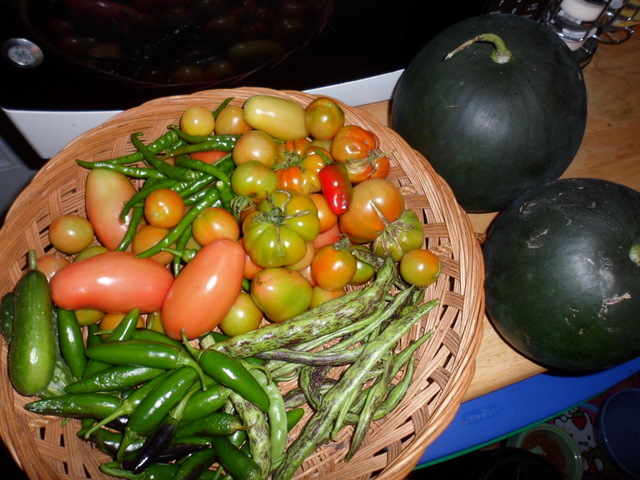 The high point of the garden is red ripe tomatoes, beans that make loud cracking noises when you break them, big messy bunches of wild flowers, and a canopy of sunflowers (they got cut down months ago, so I am over that lose). Gone are the things I have to climb under to harvest, the plants that I can hide behind if I don’t want to be engaged by my neighbors. I guess it all makes sense, winter is the time to pull in, stay close to home and rest. And given how hard my little piece of perfect worked this year it deserves the break.